With rigid budgets and procurement processes, local governments sometimes have to wait years to upgrade their technology. Luckily, with a world of developers and creative ideas, there’s a whole market of free software tools at our fingertips. From designing more engaging social media posts to better intra-office communication, these easy-to-use tools can be integrated into your regular workflow without spending a dime. To help you do this, we’ve rounded up a list of 10 free tools your local government can use to start working more productively and creatively right now. Governments are notorious for having for poorly designed, antiquated websites. To their credit, creating and updating websites has traditionally been a resource-intensive process. But what if you could create a professional, beautiful website in a matter of hours with no coding skills — for free? Introducing Wix, a drag-and-drop website building platform for everyone. Using current technology (cloud-based, HTML5), the platform has hundreds of free templates and thousands of free features and apps. With minimal investment, your local government can have professionally designed websites on par or exceeding private sector sites. The future of citizen services is online, and governments need to quickly adapt to this trend. With Wix, anytime you say to yourself, it’d be nice to have a website for this, you can just make one. Cost: Wix is free, though there are certain limitations to the free version (e.g. you have to use a Wix domain name and have limited storage). If you want to use Wix for a larger project, there are several paid plans with additional features like more storage and bandwidth. Cost: The free version of Buffer allows for one user and one social media account per platform (Twitter, Facebook, etc.). For $10 a month you can add up to 10 users and 10 accounts per platform. You send an email telling co-workers that the planning meeting got moved. Another one enticing people to eat the extra food in the kitchen. A group email thread about an important project suddenly gets interrupted by a message announcing a media event at city hall. Does this constant stream sound familiar? If you’re using internal email for simple communication, Slack could be a game-changer. It’s a messaging platform that allows teams to collaborate more efficiently. Users can be a part of multiple “teams”, with each having different channels to organize conversations by topic. You can communicate with one person directly or any group of people relevant to the conversation. Slack also makes it easy to upload files (no more sending an email every time you update a spreadsheet), integrate with other tools, and search your archived conversations. While Slack is helpful for almost any type of organization, it’s especially useful for government employees who have to work on multiple projects simultaneously, many times collaborating across departments. Cost: Slack is free for any sized team. There are paid versions for additional features like storing more than 10,000 messages or 24/7 customer support. Before, governments could excuse dull, uninspired digital designs, because it was hard to make beautiful things without a professional designer. Now, there’s Canva, the design tool for everyone. With Canva, local governments can make a professional looking announcement for an upcoming community meeting, a social media post advertising a citizen survey, or a presentation on new changes to zoning laws. Using their templates and drag-and-drop platform, these designs can take a matter a of minutes. In an age where many people are going to interact with their governments online, it pays to have better design. Governments need to be creative to compete for engagement against a flood advertisements and viral videos. A tool like Canva means you can do this at no cost with minimal effort, helping governments brand themselves while also showing off some personality. Cost: Canva is free for up to 10 people. For about $13 a month you get some additional features like the capability to resize designs and save templates. An important part of creating user-friendly government services is collecting and incorporating feedback. Surveys are one of the most useful ways to gather feedback, whether for specific projects or to measure general citizen satisfaction. Google forms is 100% free and allows you to create unlimited surveys/forms, have unlimited respondents, and use skip logic (skip questions based on previous answers). You can add your own videos and images, and embed Google Forms into emails or websites. Best of all, it automatically collects responses in Google Sheets. Using a platform that makes it this easy to design, collect, and analyze survey data means your government is a lot more likely to actually ask for feedback. And more feedback means a more user-friendly, effective government. Cost: Google Forms is free, all you need is a Google account. The social media app for live streaming. Facebook Live lets you easily broadcast live video to a public (or private) audience. The potential uses for local government are endless — streaming city council meetings, local community events, street closure announcements, or announcing new official appointments. Here’s one example of the City of East Providence Rhode Island promoting an upcoming city council meeting via Facebook Live. Cost: Facebook Live is free. But if you’re interested in hardware and a more professional streaming operation, check out Boxcast, with solutions made specifically for governments. Trello is a visual-based productivity app designed to make collaboration easier. Like Slack, Trello is perfect for the government employee who has to work on multiple projects at once, collaborating with one or more teams of people. With the user-friendly drag-and-drop interface, teams can do things like visually map out project timelines, quickly assign people to different tasks, and use color coded labels. Governments are often stereotyped as slow and inefficient. But in reality, local governments are full of creative, hard working people, often trying to achieve great things with few resources. A productivity app like Trello is a free way to superpower government efficiency, and it’s actually fun to use. 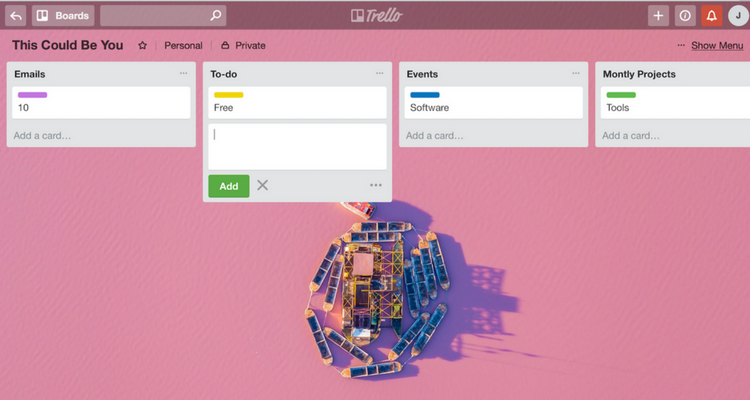 Cost: Trello is free with unlimited team members, boards, cards, and lists. For $10 a month Trello users can get additional features like app integrations (Google Drive, Slack, Dropbox, etc.) and the ability to add larger attachments. We’ve already stressed the importance of a strong social media presence for local governments. Along with Canva, GIPHY is great tool for creating more engaging social media posts. You can express a lot with a little bit of animation! Using your own video files, or URLs directly from YouTube or other online sources, you can create GIFs within a matter of seconds. There’s also an entire searchable library of free GIFs to easily pop into an email or social post. RecordIt is a simple, efficient screen recording tool. Maybe, for example, you need to record your screen to make a video showing residents how to fill out an online application. With RecordIt, all you need to do is pick the part of your screen to record and push the button. With one click you can save or tweet the video, or turn it into a GIF. More and more government services are moving online. While many residents will appreciate increased online options, there are some who will need help with the transition. Using a screen recording tool is an easy, effective way to create video tutorials and GIFs to explain these online processes. Cost: The free version of RecordIt is easy-to-use, but it does not record sound and there’s a 5 minute cap on recordings. The pro version is $29 (one-time) has a few extra features, but is only available on Mac. If you need additional functionality, check out these other screen recording tools. One of the best things about working in local government is that projects often involve working with many people from overlapping departments. But scheduling meetings with several busy people can be frustratingly difficult. Taking into account factors like employees working in the field and departments spread out across the city, scheduling a meeting can take longer than the meeting itself. If you want to make scheduling more efficient, Doodle is your tool. Doodle allows invitees mark their availability within a given time parameter. Using this “voting” process, users can quickly see the best time to schedule an event or meeting based on when the most people are available. The platform allows you to connect your personal calendar (Outlook, Google, Microsoft 365), so you can keep track of all Doodle polls in one place. You can use Doodle on the web or on mobile, and send out polls in an email or any messaging platform. Less time wasted on scheduling means more time to focus on important things — like governing. Cost: Doodle is free. For a little over $30 a year, you can get additional features like sending automatic reminders and requesting additional information. Incorporating new technology into local government can be fun and easy, especially when high-quality software apps are being developed and improved every day. Exploring these options means making an investment into a more productive, efficient, and creative government.